New Laminates. New Looks! With our new laminate options, your customers can create just the right look for their event. 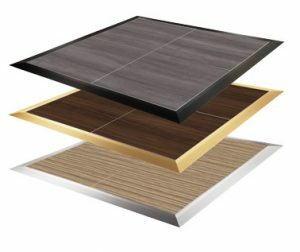 Choose from a wide variety of laminates for Cam-Lam or our popular indoor/outdoor Starlight II dance floors. Or select a classic look with traditional wood oak parquet on the Cam-Lock and Original dance floors. Create the look your customers demand while enjoying SICO® quality, safety and easy-set up.